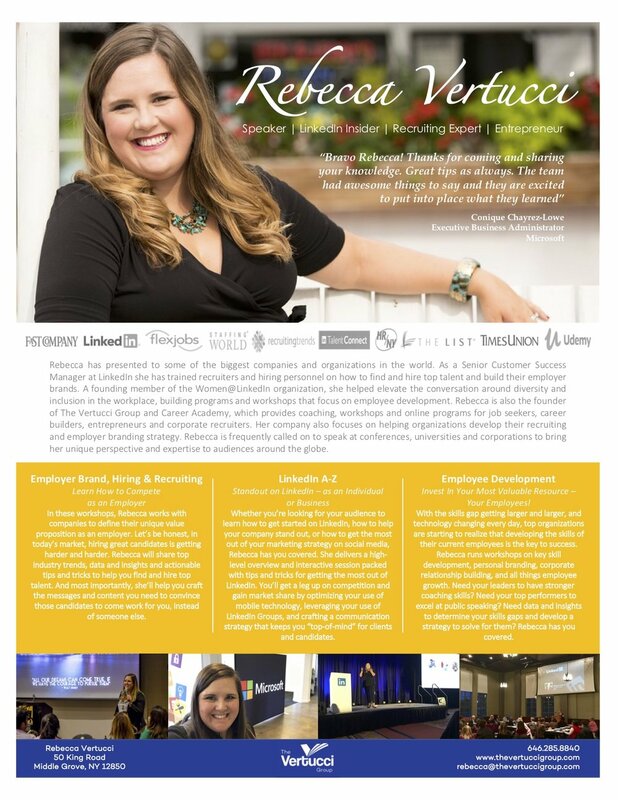 Rebecca has presented to some of the biggest companies and organizations in the world. As a Senior Customer Success Manager at LinkedIn she has trained recruiters and hiring personnel on how to find and hire top talent and build their employer brands. A founding member of the Women@LinkedIn organization, she helped elevate the conversation around diversity and inclusion in the workplace, building programs and workshops that focus on employee development. 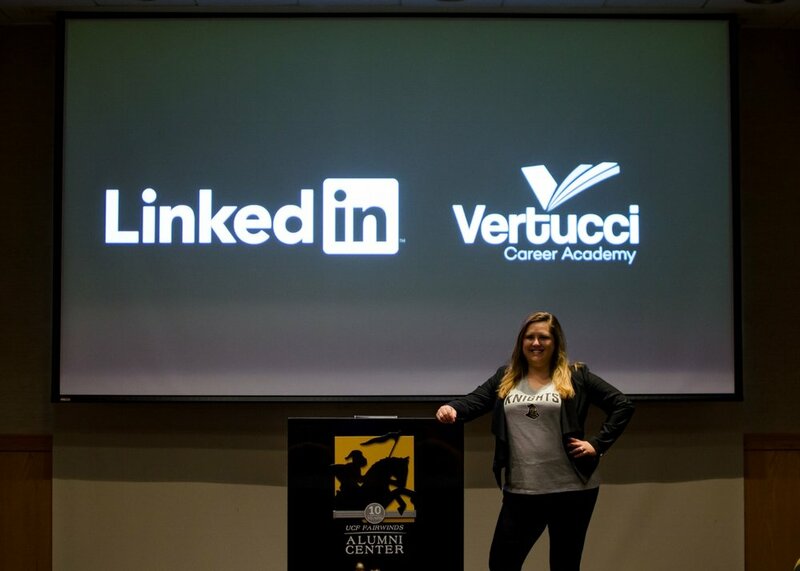 Rebecca is also the founder of The Vertucci Group and Career Academy, which provides coaching, workshops and online programs for job seekers, career builders, entrepreneurs and corporate recruiters. Her company also focuses on helping organizations develop their recruiting and employer branding strategy. Rebecca is frequently called on to speak at conferences, universities and corporations to bring her unique perspective and expertise to audiences around the globe. In these workshops, Rebecca works with companies to define their unique value proposition as an employer. Let’s be honest, in today’s market, hiring great candidates is getting harder and harder. Rebecca will share top industry trends, data and insights and actionable tips and tricks to help you find and hire top talent. And most importantly, she’ll help you craft the messages and content you need to convince those candidates to come work for you, instead of someone else. 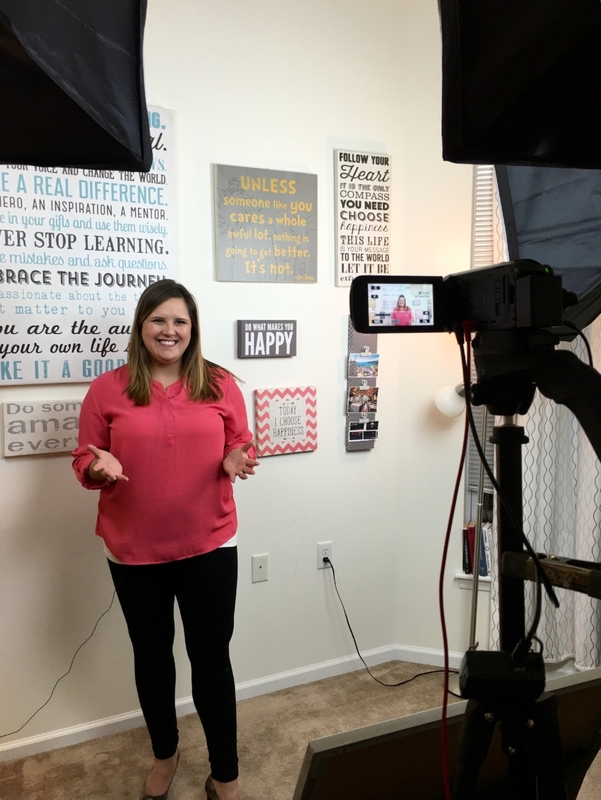 Whether you’re looking for your audience to learn how to get started on LinkedIn, how to help your company stand out, or how to get the most out of your marketing strategy on social media, Rebecca has you covered. She delivers a high-level overview and interactive session packed with tips and tricks for getting the most out of LinkedIn. You’ll get a leg up on competition and gain market share by optimizing your use of mobile technology, leveraging your use of LinkedIn Groups, and crafting a communication strategy that keeps you “top-of-mind” for clients and candidates. Invest In Your Most Valuable Resource – Your Employees! 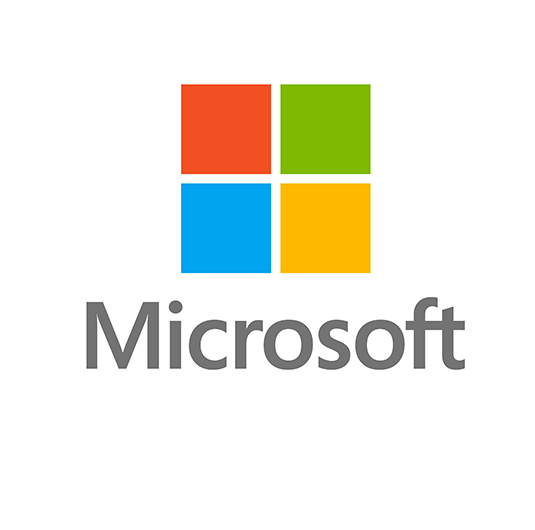 With the skills gap getting larger and larger, and technology changing every day, top organizations are starting to realize that developing the skills of their current employees is the key to success. Rebecca runs workshops on key skill development, personal branding, corporate relationship building, and all things employee growth. Need your leaders to have stronger coaching skills? Need your top performers to excel at public speaking? Need data and insights to determine your skills gaps and develop a strategy to solve for them? Rebecca has you covered. Looking to book a public speaker for your next event, conference or workshop? Please download our Public Speaking PDF to learn more about Rebecca's keynotes and areas of focus. Everyday Rebecca works with employers who struggle to find and hire great talent, while also working with amazing candidates who struggle to find great jobs. She believes she is uniquely qualified to help both sides come together to solve the hiring challenges of tomorrow. Rebecca truly cares about helping people succeed and has a proven track record of providing the tools and insights necessary to generate results. For over ten years, Rebecca has delivered hundreds of speaking engagements to thousands of people. She is a frequent speaker at the top professional conferences and is a regular contributor to online career development publications. She has dozens of online courses and webinars and she has reached over 25,000 people in person and online. Rebecca’s keynotes and workshops are highly informative, engaging and inspirational. They provide data driven insights, practical tools and real-life career experiences that help job seekers, recruiters and entrepreneurs find success. Attendees feel that Rebecca is relatable, approachable and highly knowledgeable, and they are captivated by her interactive facilitation skills. 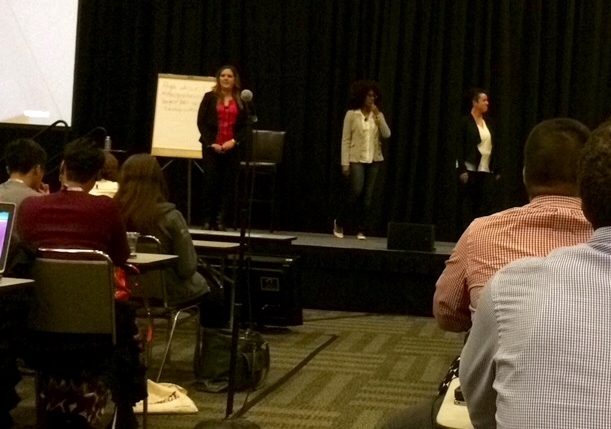 Her audiences walk away with tangible action items and next steps, paired with the motivation to get started.